In this scenario we would usually need to remove topsoil from the area before installing a stone base. This stone base aids with drainage and also allows us to ensure a smooth, level area to lay our artificial grass. Once the artificial grass is in place we apply a silica sand infill which weighs down the artificial grass while helping the fibres to stand upright for longer. Many of our customers choose to do some of the prep work themselves before we apply the finishing touches. Some choose to remove the topsoil and leave the PST Lawns team install the stone base, while others have the stone base in place. 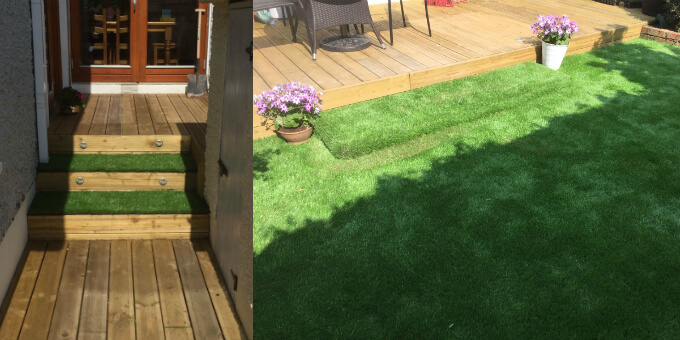 Completing part of the installation yourself can help to reduce the final cost while having the reassurance that the artificial grass installation has been completed by experienced installers. Get in touch with us for more detailed information on our ideal build up. For those of you looking to do all the work yourselves we also offer supply only on our artificial grass products. Seam tape and adhesive can be provided if needed! Our artificial grass comes in 4 metre wide rolls and can be cut to your required length. We will also provide you with all the advice you need to complete your installation. PST Lawns’ artificial grass products are designed to last. Wear and tear can turn natural grass areas into an unsightly mud patch. 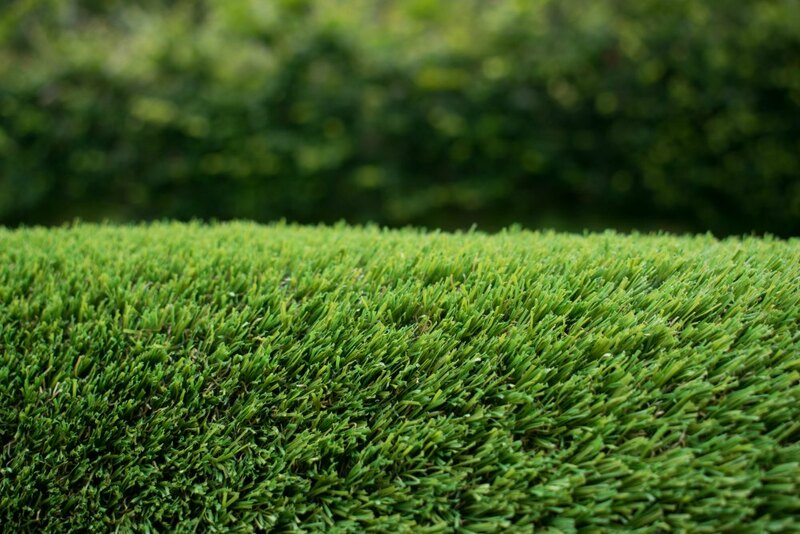 Our artificial grass products are manufactured to the highest standards to ensure they last for years and years. We also use a silica sand infill to ensure maximum longevity for our products. With artificial grass there will be no more muddy clothes or footprints being dragged into the house. Because our products are permeable, any rain water will simply drain away. Any leaves or debris can simply be swept away, and any mess from pets can be picked up and disposed of! Our products are CE approved and ROHS compliant, meaning there are no harmful chemicals used during manufacturing. 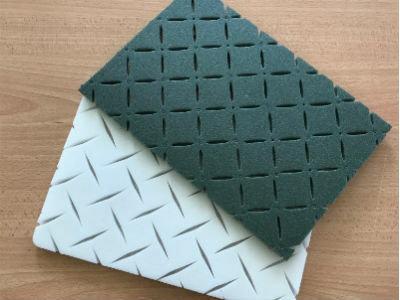 For added safety, we can also install Shock Pad underlay to provide additional cushioning. Shock Pad is extremely popular in gardens or areas that will be used by kids. 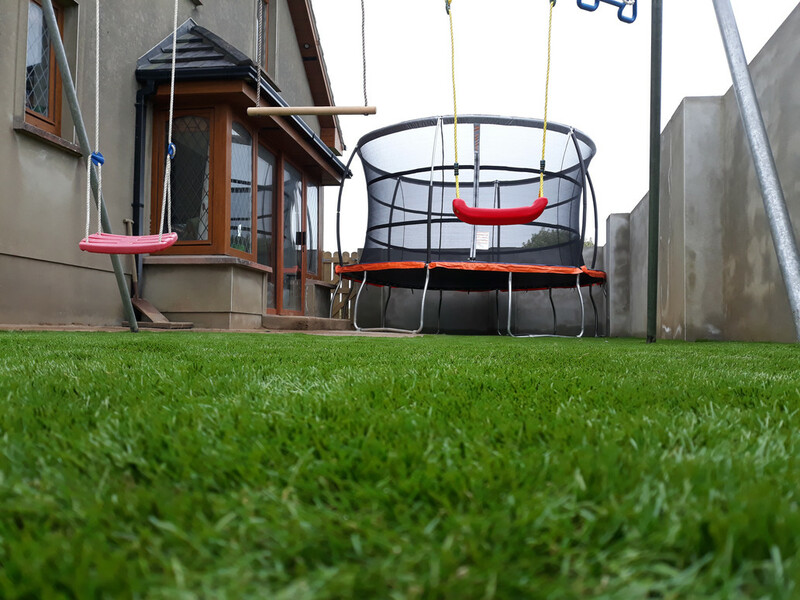 We have carefully chosen artificial grass products that look, and feel like the real thing. You will get the benefit of a natural looking lawn that requires very little maintenance, so you can get rid of that lawnmower! PST Lawns’ artificial grass products are also UV resistant so you don’t need to worry about your grass colour fading over time. PST Lawns can also install our artificial grass onto decking, patios, concrete and even rooftops! 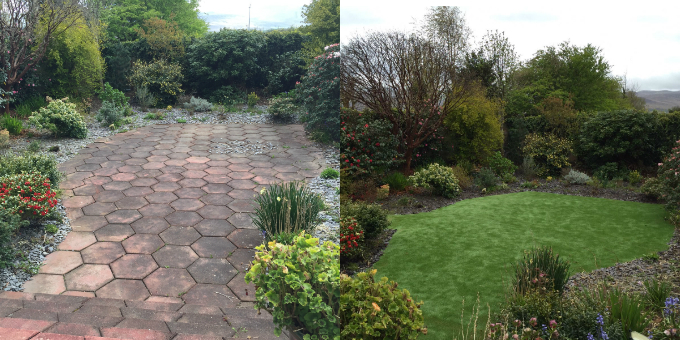 Dull areas can be transformed instantly with our products, giving you a vibrant area to enjoy. We can also supply materials only for those of you that wish to complete the installation yourself. We’re often asked by landscapers if we provide a ‘supply only’ option, and the answer is yes! PST Lawns can cut our artificial grass to the required length and deliver it nationwide. 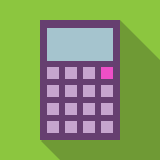 Alternatively, your pre-cut rolls can be collected from our warehouse at no extra cost! Our artificial grass products are available in 4m x 25m rolls and can be cut to length as required. We also have a limited number of 2m wide rolls in certain products. Joining tape and glue can be supplied if needed. Contact us today to request free samples! PST Lawns’ Shock Pad is a 10mm thick foam pad that is installed underneath our artificial grass. Shock Pad provides excellent impact protection and cushioning and we would recommend that it is installed in any play area for children. Schools and creches often install artificial grass to give their children an outdoor play area that can be used in all weather conditions. The addition of a Shock Pad underlay will give teachers and childcare assistants reassurance that the children are protected when they stumble, fall or jump on the ground. Can Shock Pad be installed in gardens? Of course it can! 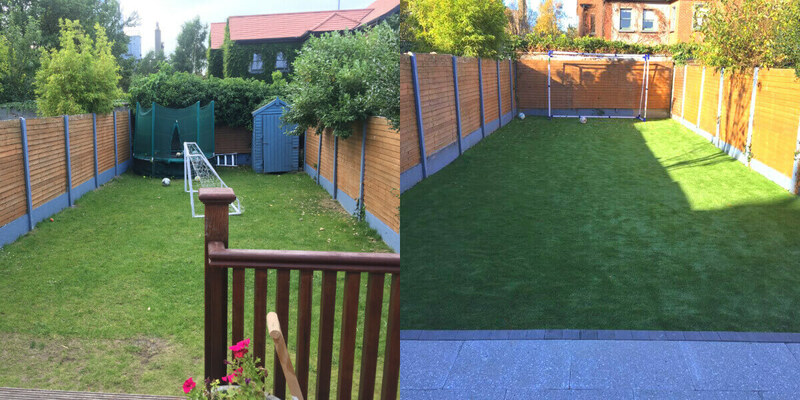 If your garden is used as a play area, Shock Pad can give you piece of mind that any impact from falls or bumps is minimised. 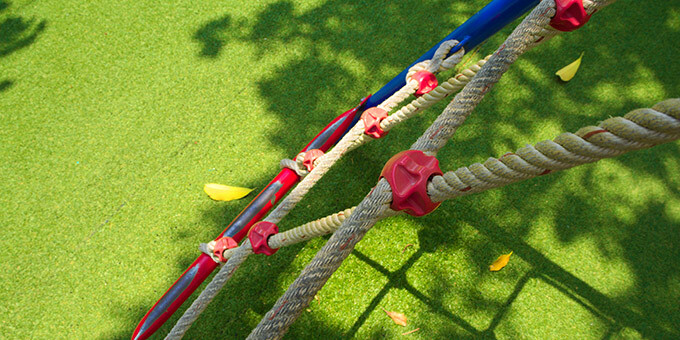 Very often we install our Shock Pad near trampolines, swing sets or play equipment. Coupled with our artificial grass, your garden will be a safe, clean and hard wearing place for everyone to enjoy! What about concrete, paving or decking? No problem! PST Lawns’ installation team can install Shock Pad onto almost any surface. Installing artificial grass onto concrete, gravel, paving or decking is a popular option for many people. Having a layer of Shock Pad underlay will ensure that your new lawn feels soft and safe underfoot. Shock Pad is also a great option for gyms and sports clubs looking for an indoor functional training area for members and players. Get in touch with us for a quote today! Gravel is often installed when people are looking for a low maintenance, hard wearing garden. It is certainly hard wearing but can prove difficult to maintain, especially if weeds or grass begin to grow up through it. And it can look boring and monotonous after a while. PST Lawns artificial grass can be installed directly over gravel in most cases, transforming gardens into a vibrant and inviting space. Providing there is good drainage, we can compact and level the existing gravel, top up with a layer of sand and lay our artificial grass directly on top! In most situations we would also install our Shock Pad underneath the artificial grass carpet to provide additional cushioning underfoot. Shock Pad is a great option for families with young children who will be playing on their new lawn no matter the weather. Installing over gravel can also be a cheaper option than a full installation. Get in touch with us today for a free quote! Artificial Grass, Astro Turf, Synthetic Turf, Fake Grass-it’s all the same right? The artificial grass used for residential and corporate landscaping is specifically designed to look and feel like real grass without the need for constant care and maintenance. Usually these artificial grasses have a pile height of 30-35mm and only require sand infill to give a more stable base underfoot. PST Lawns’ TRU Grass, FRESH Cut and EVERGreen are ideal for residential gardens and corporate spaces. GAA, soccer and rugby pitches require artificial grass that has a much higher pile height, usually 50-60mm. 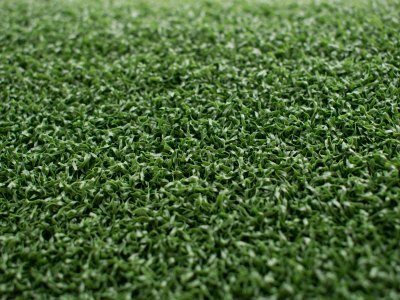 Both sand and rubber infill are then used to allow the artificial grass carpet to perform like a natural grass playing pitch. 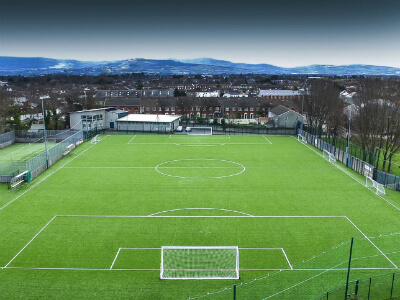 PST Sport are a leading installer of all weather pitches across Ireland and the UK. Putting greens require an artificial grass carpet with a pile height of 16-18mm. The shorter pile height gives a consistent, true ball roll. 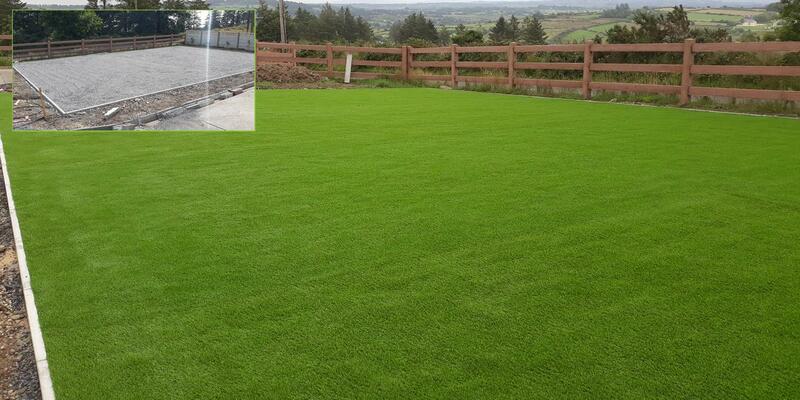 TEE Green is a high quality artificial grass carpet installed by PST Lawns in home putting greens all over Ireland and is available with stimp ratings of 8 (slow), 10 (medium) or 12 (fast). Contact us for a quote today. MUGAs are a popular option for schools as it allows for a number of different sports to be played, including basketball, hockey, football and tennis. A 24mm pile height gives the ideal surface for multi use and a sand infill provides stability and durability underfoot. PST Lawns MULTI Use artificial grass also has split fibre technology which further increases the durability of our installations. Can artificial grass be installed on decking or paving? Although they seem like a maintenance free option, decking and paving stones require a lot of care and attention. By installing artificial grass you will eliminate the need for intense weeding, cleaning and brushing. Giving you more time to relax and enjoy your garden! PST Lawns’ artificial grass can transform decking or paving that may be treacherous in wet weather into a non-slip area that is safe for everyone. Garden steps that may have been tricky to negotiate in the rain will no longer be a cause for concern. Our artificial grass products are extremely durable meaning they are perfect for high traffic areas. We can also install our Shock Pad when covering concrete paving or decking areas to provide a softer, and safer, area for kids to play. 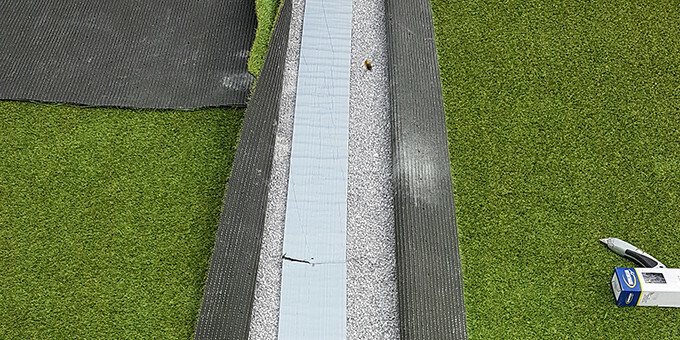 Shock Pad is laid directly under our grass carpet and provides additional shock absorption which reduces the risk of injury. Functional training zones have become a big part of gyms in recent years. More and more people are now engaging in functional training as the fitness industry continues to boom in Ireland, and worldwide. This back-to-basics approach to training has seen prowlers, sleds and tyres become an integral part of any modern gym. Our synthetic grass is ideal for use with sleds and prowlers allowing them to glide across the surface without sticking or causing damage. The grass surface will also give users a better grip which means they can push their training to the limits without having to worry about losing their footing. Plyometric exercises, tyre flips and SAQ are also suited to being carried out on a non-slip, durable artificial grass surface. 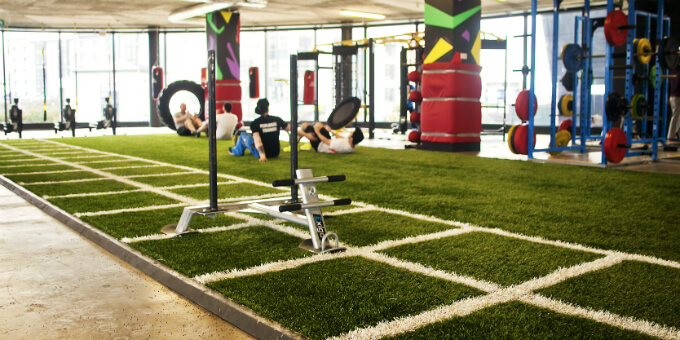 Aesthetically speaking, an artificial grass area can make a gym or training facility more exciting, colourful and appealing to current and future members. Our products are also extremely durable and require very little maintenance. 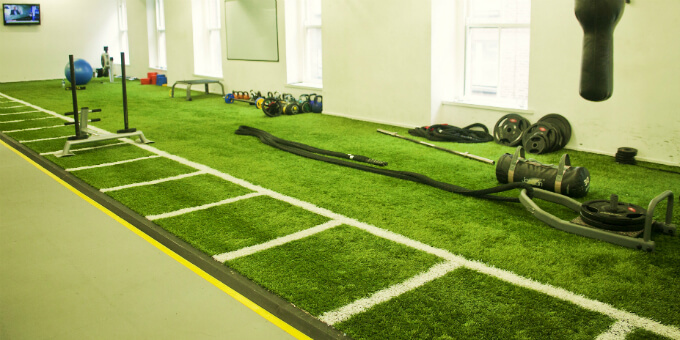 Contact PST Lawns today to discuss how a synthetic grass functional training area can benefit your gym or sports club. Artificial grass for pets is a safe and clean way to ensure your garden keeps looking green and grassy all year long. And you won’t have the hassle of grass cutting, weeding or fertilising! 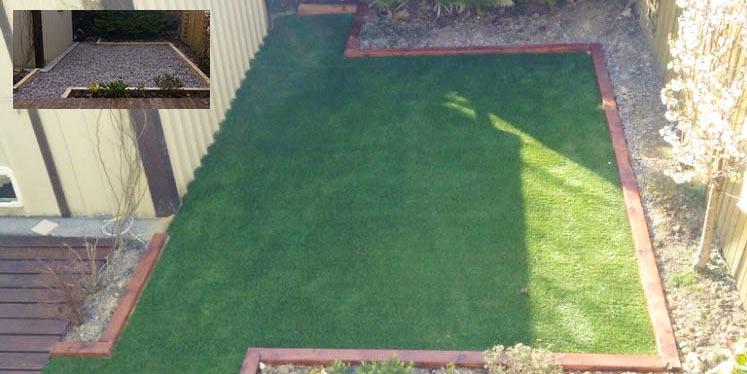 Your pet will love a PST Lawns artificial grass garden, and so will you! An artificial grass lawn will stand up to wear and tear year after year, making it a perfect choice for gardens that get high volumes of usage or traffic. The days of cleaning muddy paw prints will be over with a PST Lawns garden! Your pets will be able to enjoy the garden hail, rain or shine, without destroying the house. 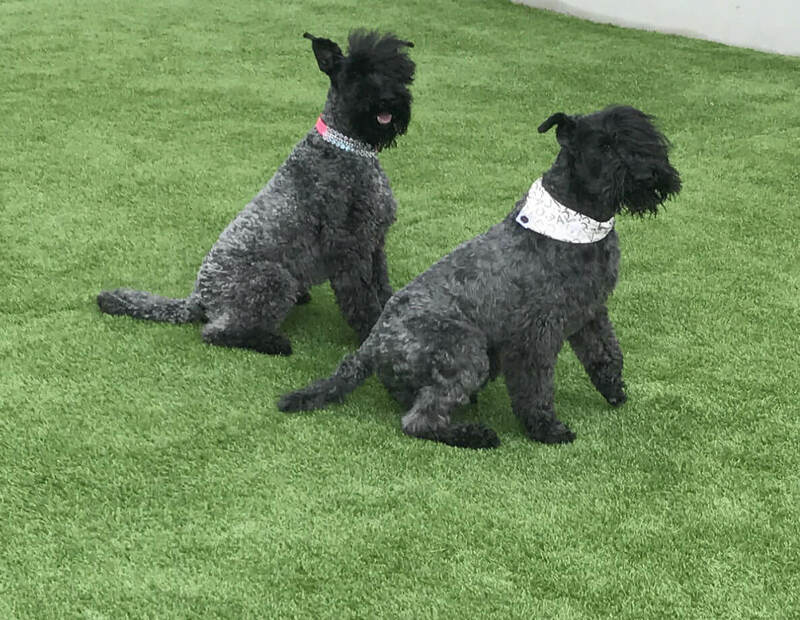 Our artificial grass also doesn’t stain if your pet uses it to do their business! Any mess can easily be picked up and a quick spray with the garden hose will take care of any odours. Having artificial grass installed will ensure that your kennel or dog run stands up to being used day after day. Your pet will still love having the soft, natural feel of grass under their paws! When the weather is destroying your garden, grass lawns can cause a serious headache. Grass lawns require mowing, trimming, weeding, etc. that takes money and time to maintain. Our artificial grass doesn’t need to be mowed, trimmed, or treated with any chemicals. It is also made from 100% permeable material meaning any excess water, including rain water, will soak right through it. We will also ensure adequate drainage is in place so garden puddles will become a thing of the past. All that is required from you is an occasional sweep to remove any debris, e.g. leaves, and your garden will look immaculate with little effort. You save time and money by choosing artificial grass. 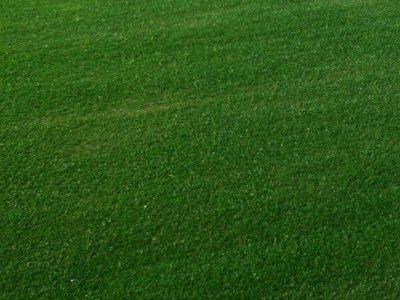 To maintain a natural grass lawn, it requires a lot of time and money. You make one long term investment and then sit back and relax knowing your garden will remain in top condition for many years. Nearly 500,000 people in Ireland suffer from asthma with about 70% of these people also having hay fever. Allergies are extremely annoying and disheartening during periods of good weather and being around grass lawns may stimulate your allergies. Pollen released by plants and grass can trigger an allergic reaction in hay fever victims, which causes them to feel congested, scratch, itch, sneeze, etc. Artificial grass is a perfect solution. It can definitely alleviate the stress of going outside and sparking an allergic reaction. 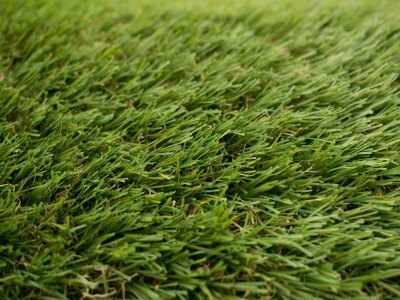 Artificial grass looks as realistic and as green as natural grass. You want a garden to look as good in the depths of winter as it does in the middle of the summer and artificial grass lawns enable that. Our artificial grass is suitable for playground equipment and garden furniture so it’s ready to be designed, decorated, and customised to the client’s needs. They are great for the environment in a lot of different ways. They don’t require watering and petrol fumes from a lawnmower. Our artificial grass provide a clean, safe area for your kids to play and it’s also ideal for pets. The non-slip, hard wearing surface make muddy footprints…& paw prints… a thing of the past. If you are thinking of installing an artificial grass lawn we would love to hear from you. LoCall: 1890 917 006 or Email: hello@PSTlawns.ie. Alternatively, you can contact us directly via the website and one of our team will get back to you.